Matt and his team at Metrix Create Space have been working on something really BIG! In fact, our team and their team have been engaged in a bit of a competition with our big robots. The Metrix crew is in the lead. A hardy congratulations to them! AWESOME! The Metrix crew has an old DynaCNC 1000. We have an old DynaTorch Plasma CNC. Both team’s robots are classic big framed 3-axis gantry robots in the 4 foot by 8 foot by 1 foot (1.25 x 2.5 x 0.5 meter) build space. Both teams are trying to take it to the next level — something really big — FDM on a large scale. If you’re already using a Makerbot or a RepRap, then you might be able to 3d print a door stop BUT what if you could print the whole door too? Let’s do some good old back of the envelope “pretengineering”. 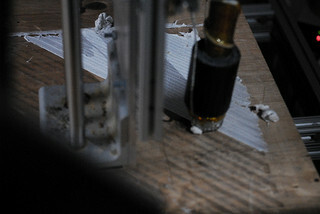 If you print with a Makerbot or a RepRap, then you are printing in mm’s with a 0.3-0.4 mm extruder nozzle. Now imagine if your big robot ran in inches! It’s a 25.4 scale up if you run the same G-code (from RepSnapper or Skeinforge). Thus you need a 0.3*25.4 = 7.62 mm nozzle. Everything else scales. The next interesting question… What do we use for material? And where do we get THAT much material? Recycled Plastics is a great choice (another form of personal recycling). The Metrix crew is exploring milk jugs (polyethylene) as their build material! I think the nozzle calculation (7.62mm!) might be a bit off. If you need a 25.4X flow rate, wouldn’t you need the cross-sectional surface area to be 25.4X as big? 25.4* (.2826) = 7.17 = Pi * (1.5)^2, or the new nozzle would be 1.5mm diameter. for the diameter of the nozzle was the design goal.